Sign up and receive Property Email Alerts of Houses for sale in Paradise Beach, Langebaan. A Modern, Elegant and Luxury 5 Bedroom, 4.5 Bathroom Multi Storey Home for Sale in Paradise Beach. This Home provides an Authentic West Coast, Greek like feel with Modern Finishes and Free Flowing Open Space. Opening up to Breathtaking 180 deg... Sea Views of Saldanha Bay and the Atlantic Ocean. A short walk down to the Pristine Beach that brings you to the Paradise Beach Boardwalk with its white sandy beaches. Only a 10 Min drive to Midtown Langebaan offering its Popular Shops and Restaurants. 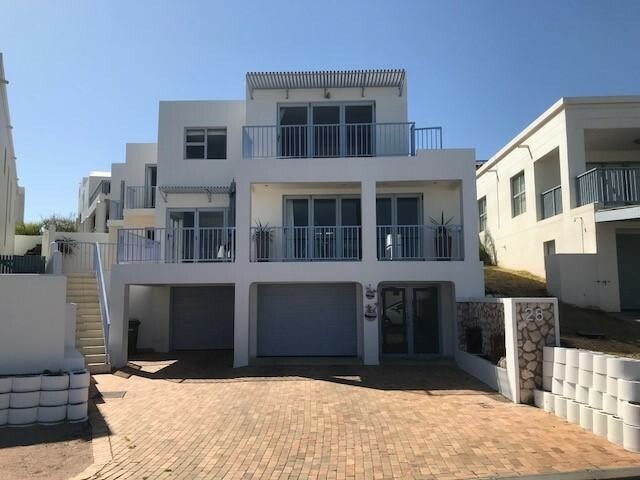 West Facing towards the Atlantic Ocean and Saldanha Bay and offers Stunning Sea Views from the Balconies, roof top and Outdoor Braai Area. Perfect for a Holiday or Family Home and Only 60 Min drive from Cape Town. * Magnificent views over the Bay and Atlantic Ocean. * Large and Spacious Open Plan Living / Dining / Kitchen / TV and Fireplace Areas. * Sliding Doors leading out from Entertainment and Braai Areas onto Balconys. * Sliding Doors leading out from Living and Kitchen Areas to Back Yard. * Laundry and Dishwashing Machine Points in Garage. * 1 of the Bedrooms can be utilized as a Study. * The Perfect Setting to enjoy your beautiful late afternoon Sunsets. * Sliding Doors leading out onto Balcony and outdoor Braai Area accompanied by Sea Views. * Large Skylight above staircase. * Understaircase Storage / Pantry. * BIC throughout entire Home. * Land Size 342 sqm in extent. * Building Size 425 sqm in extent. Sign-up and receive Property Email Alerts of Houses for sale in Paradise Beach, Langebaan.